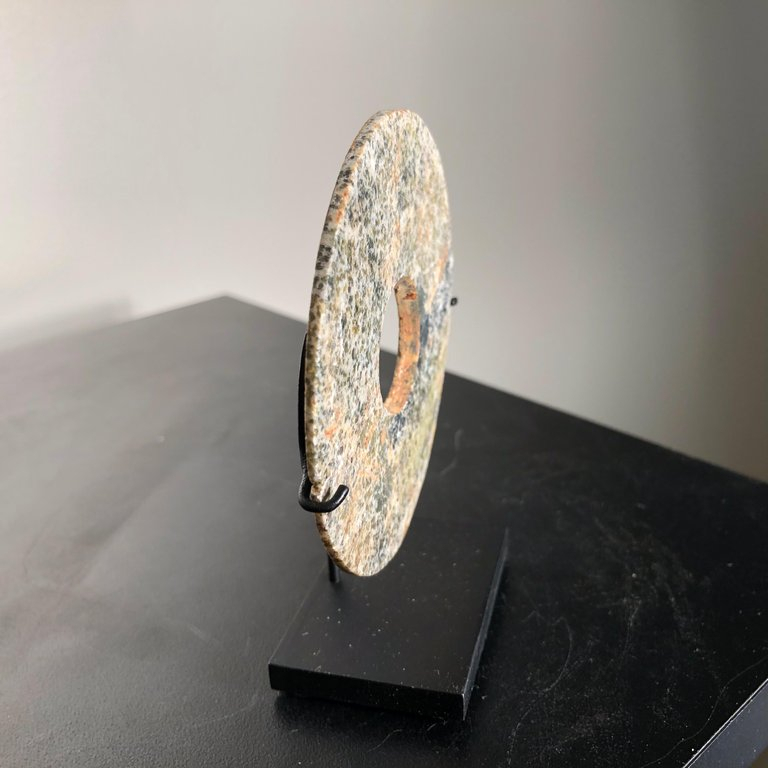 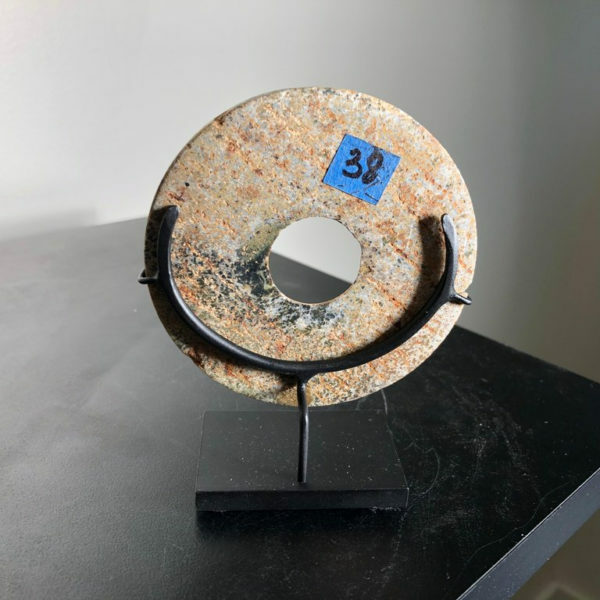 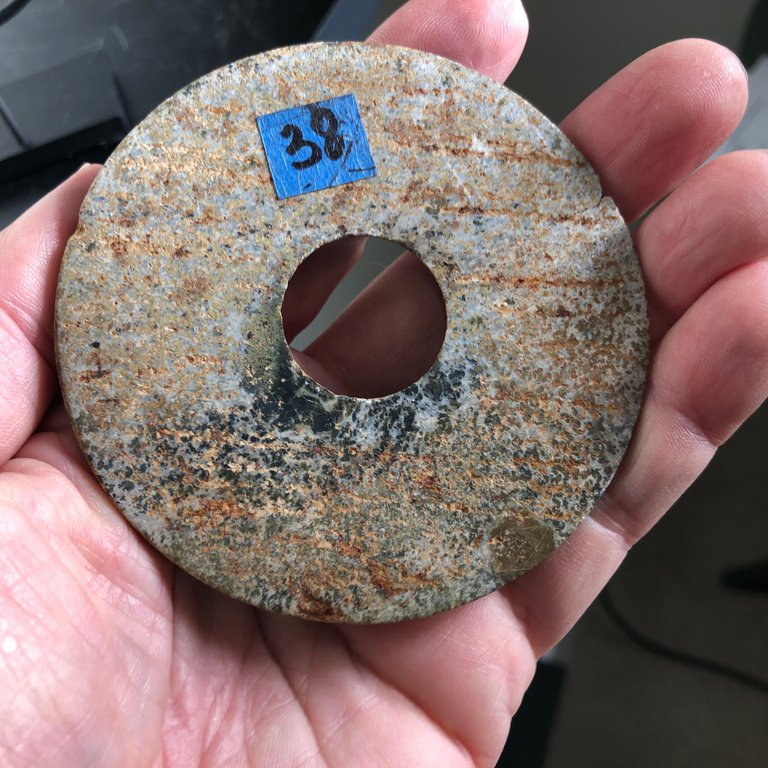 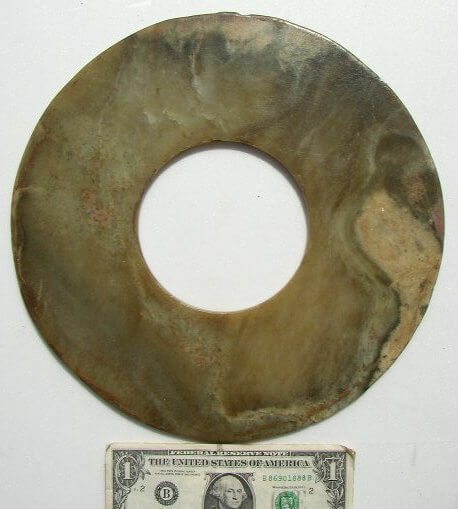 This is an authentic Chinese ancient jade bi disc from the Qi Jia Culture, Northwestern China, 3,000-2,000 BCE. 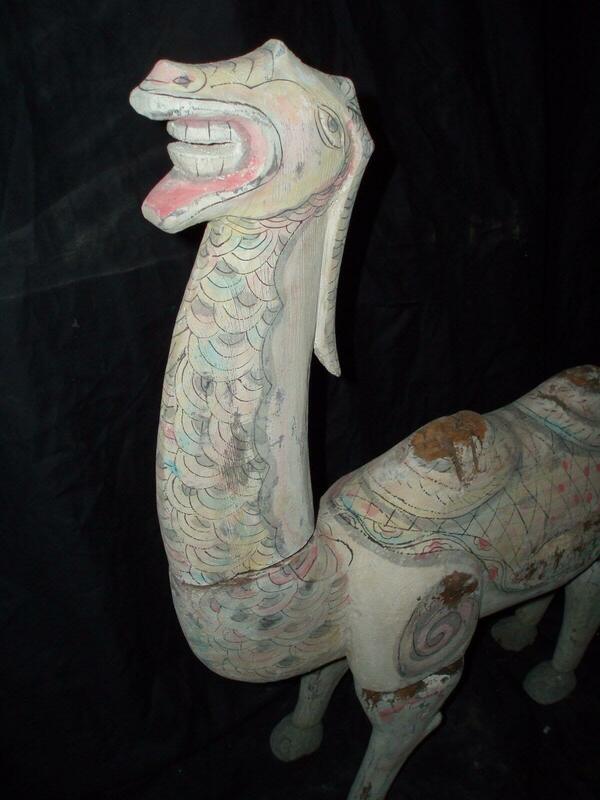 This comes from our private collection. 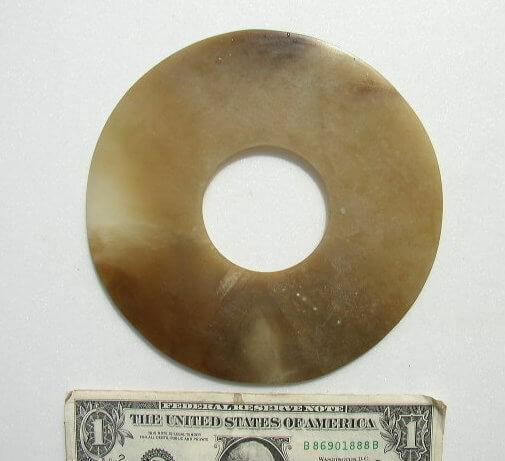 This is a very nice medium size example with very nice color. 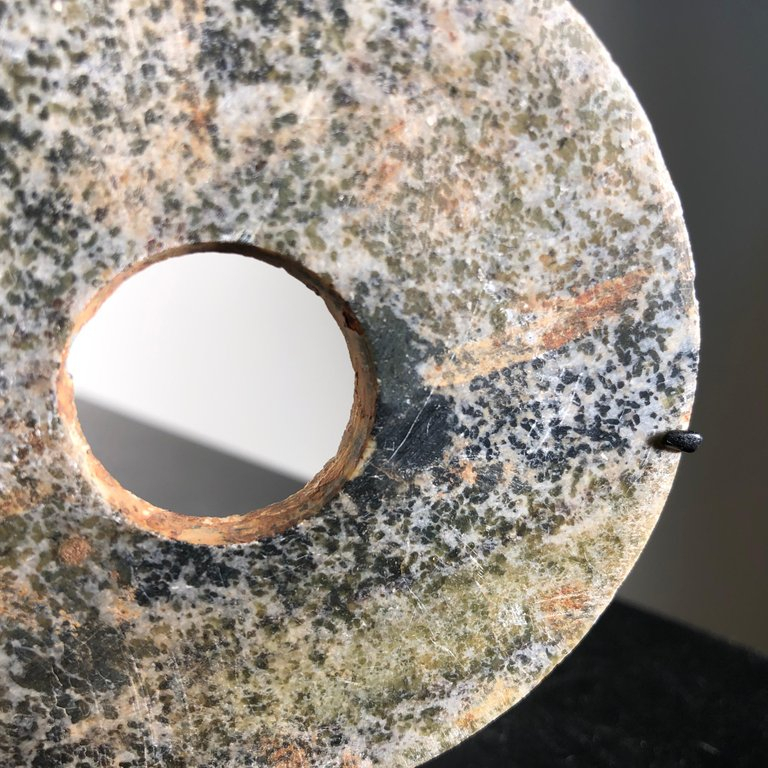 This jade like others from this ancient period of time were cut and fashioned hand abraded using natural organic string made from vegetation combined with sand paste and water- these were the tools used to abraid and cut hard jade stone. 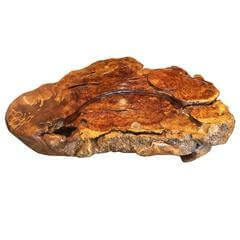 In addition this bi displays a beautiful calcified mineralization from being buried underground for thousands of years. Our private collection and accompanied by our Lifetime Guarantee of Authenticity. 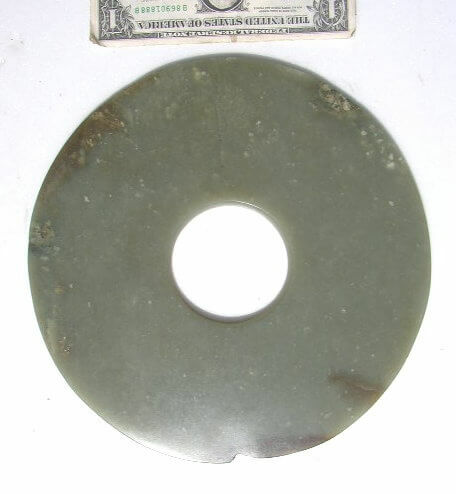 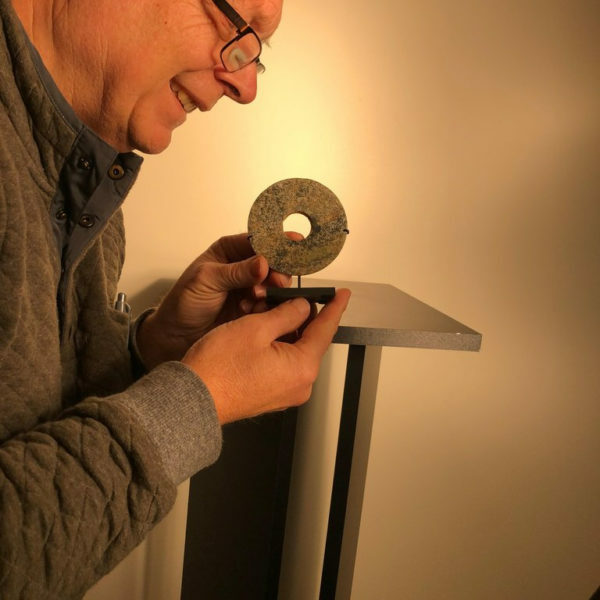 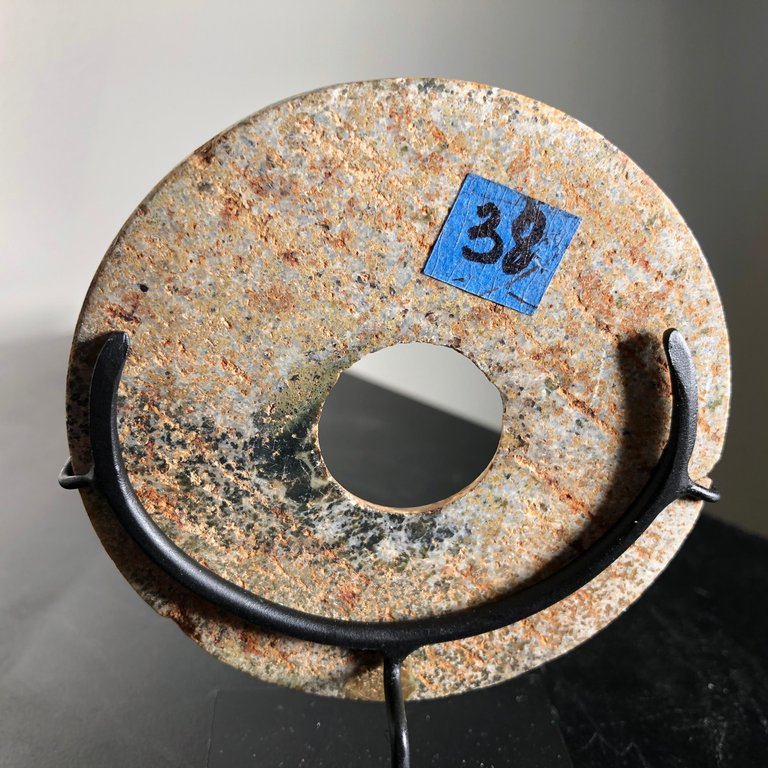 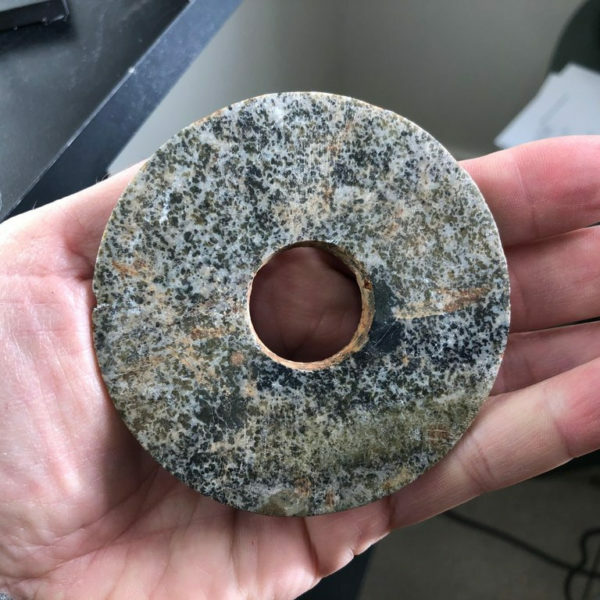 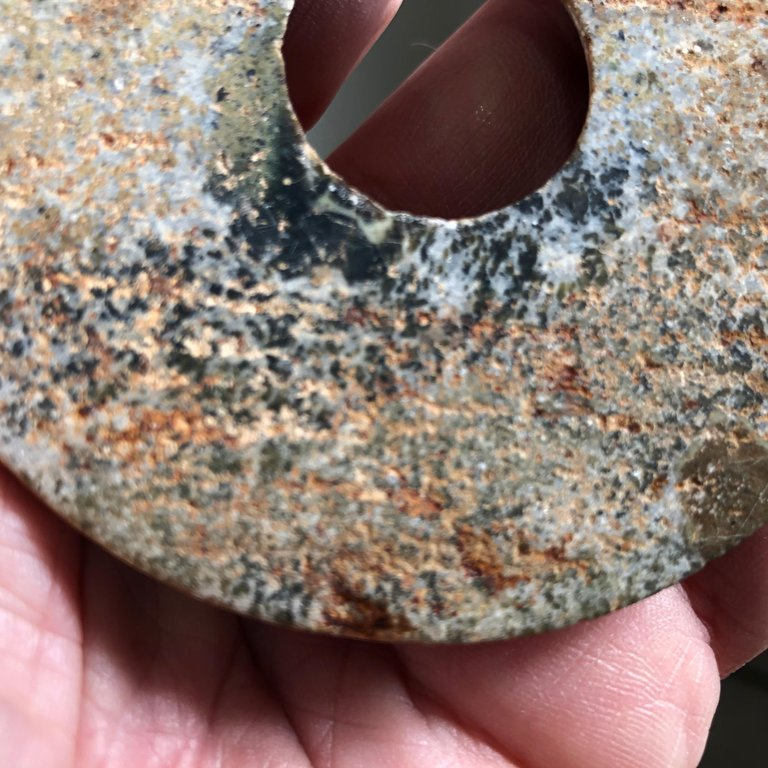 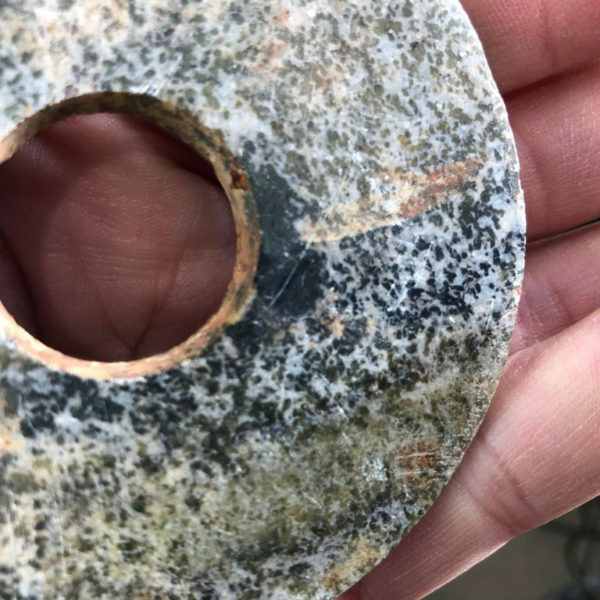 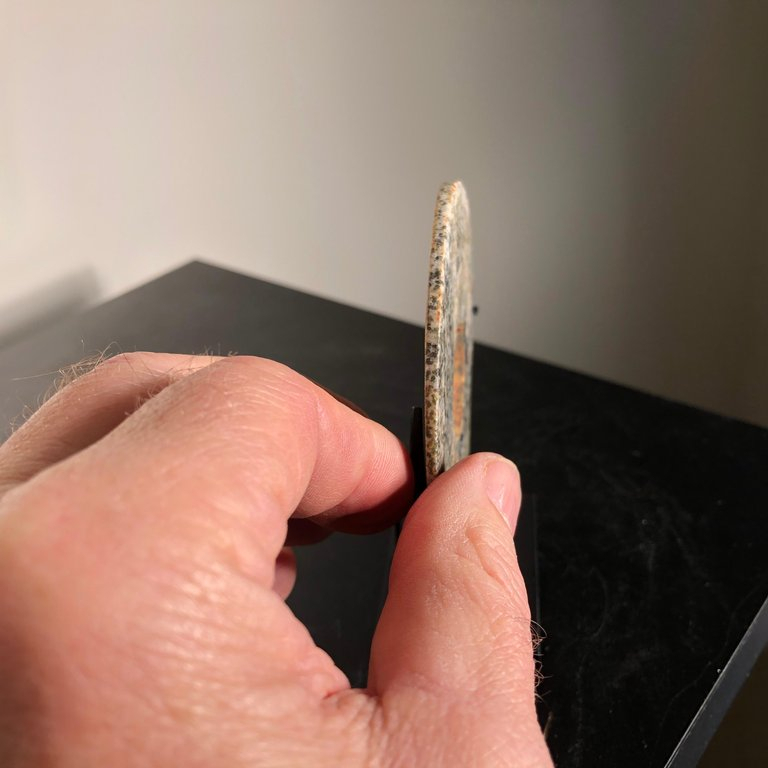 Flat jade discs with a round central hole are among the earliest surviving artifacts of China and must be considered among great ancient art forms- masterpieces of the Neolithic period. 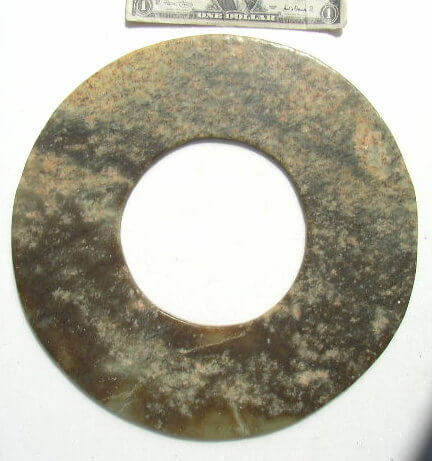 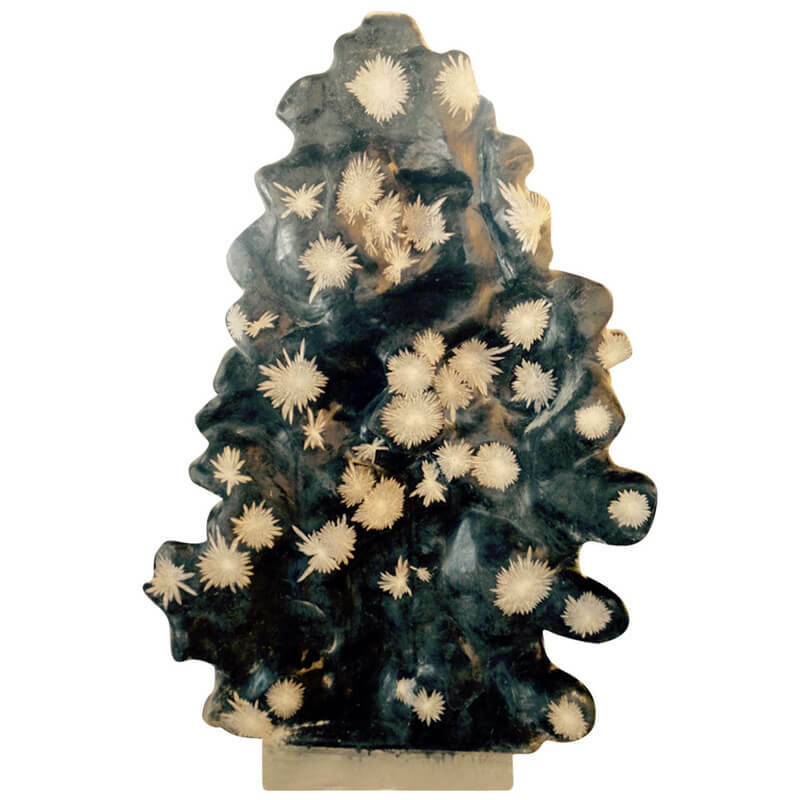 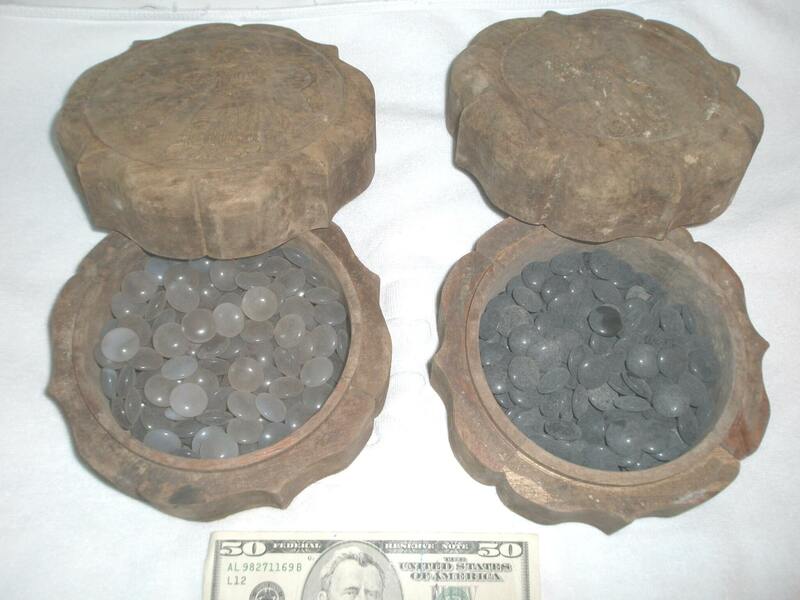 Nephrite jade from which discs were fashioned is a prime hard and strong stone, arduous to work by hand using Primitive stone tools and abrasives. It’s no wonder then that jade discs bi represent remarkable craftsmanship. 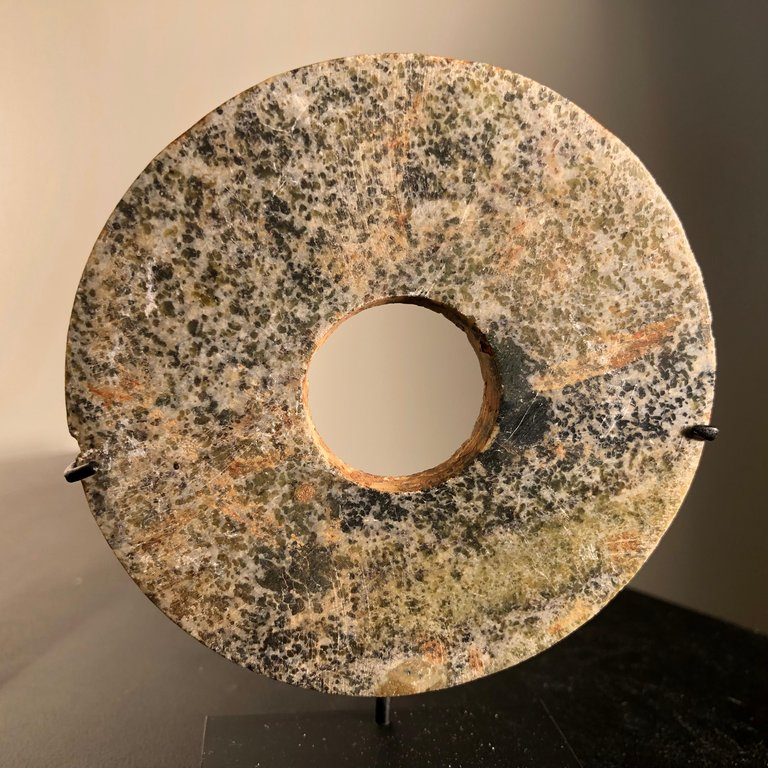 While all theories presented to date are speculative, we can forward one Based Upon the warring states text Zhou Li that bi are thought to represent symbols of heaven and were used in ancient rituals together with square tubes cong symbolizing the earth. 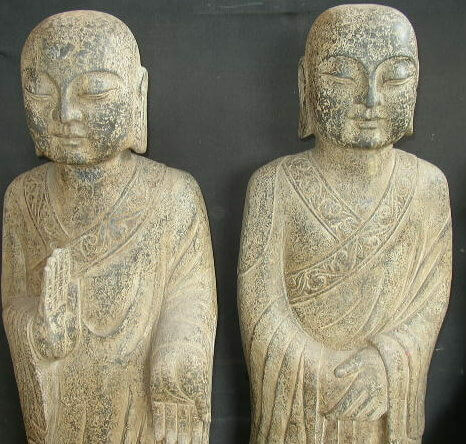 To worship heaven with a bi explains their importance and use. 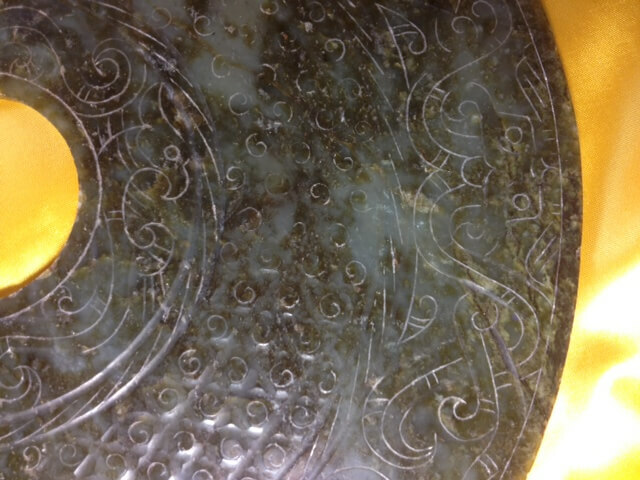 Bi also symbolize status of high social rank and sheds light on why many carved jades have been found in Zhou royal tombs. 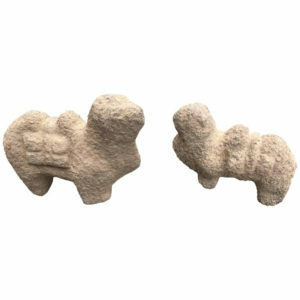 They are prominently found in varied qualities, quantities and sizes. 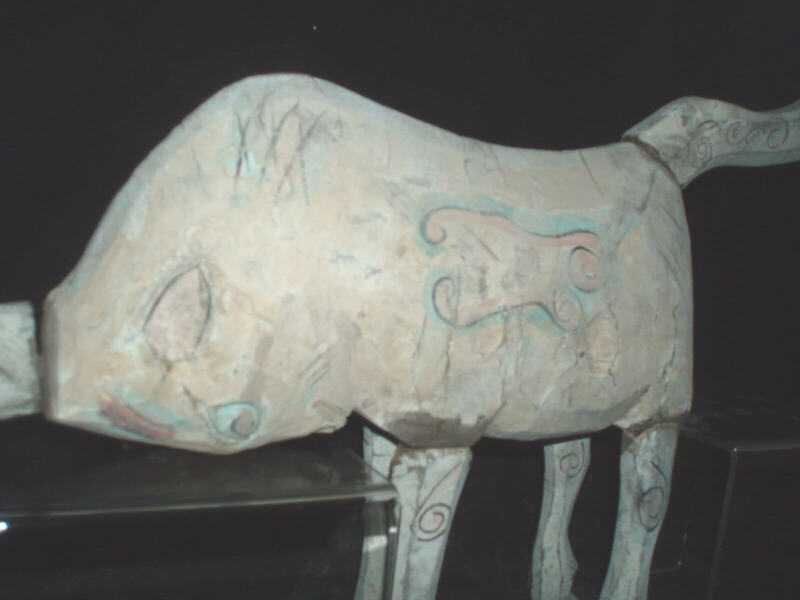 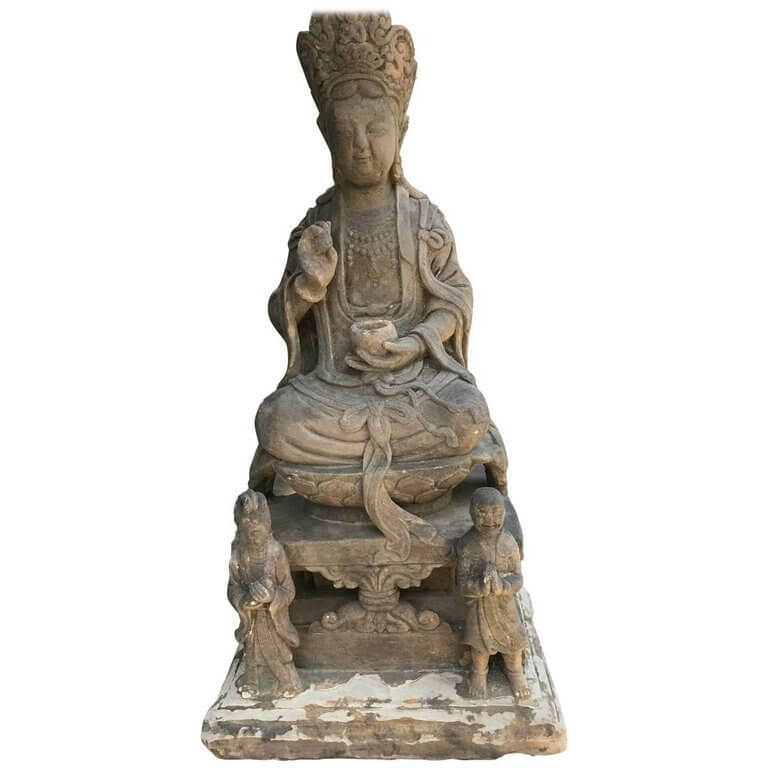 Their ritual prominence stretches from the most ancient of Chinese history- Hongshan/Liangzhou/Longshan (4700-2190 BCE) Qi Jia cultures and on to the Zhou dynasty (3000-250 BCE) onwards. 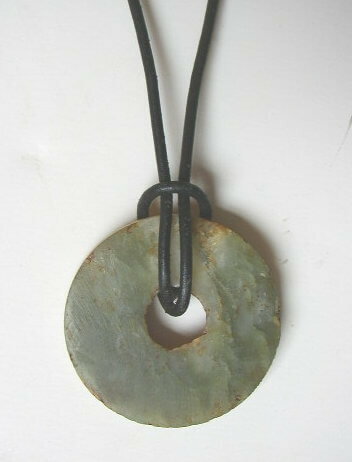 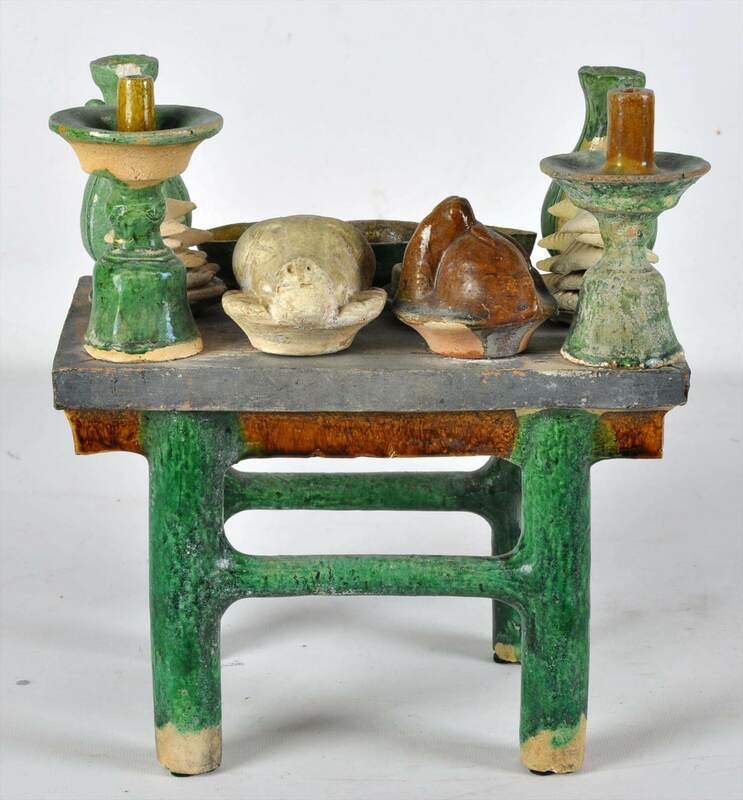 Today jade bi are emblematic of power, status and privileged classes and offer more complex, varied meaning. 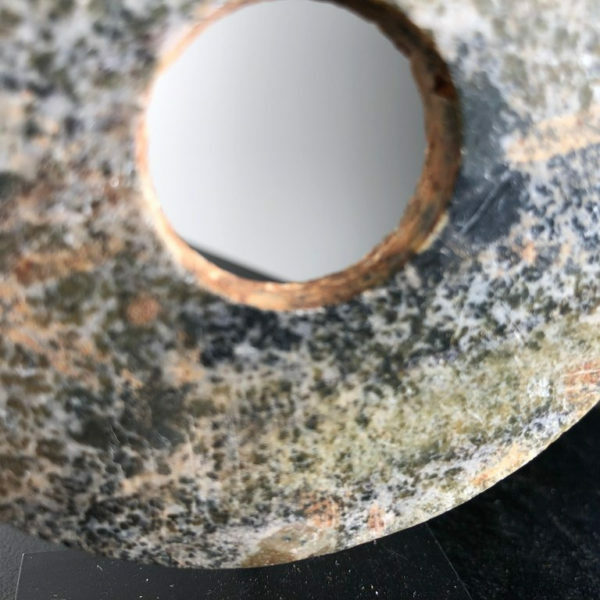 Please refer to these excellent publications: Jessica Rawson, Chinese Jade from the Neolithic to the Qing, exhibition catalogue The British Museum, London, 1995, pp 13ff, and Section 4. 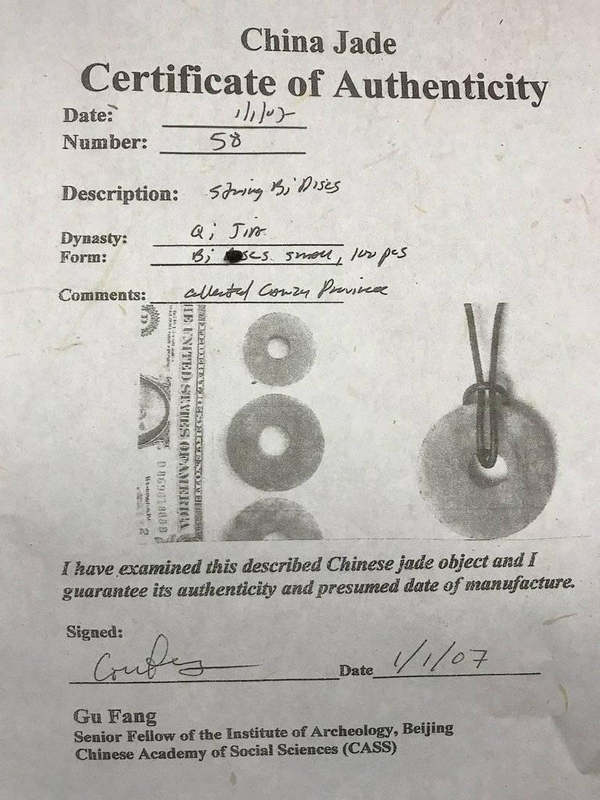 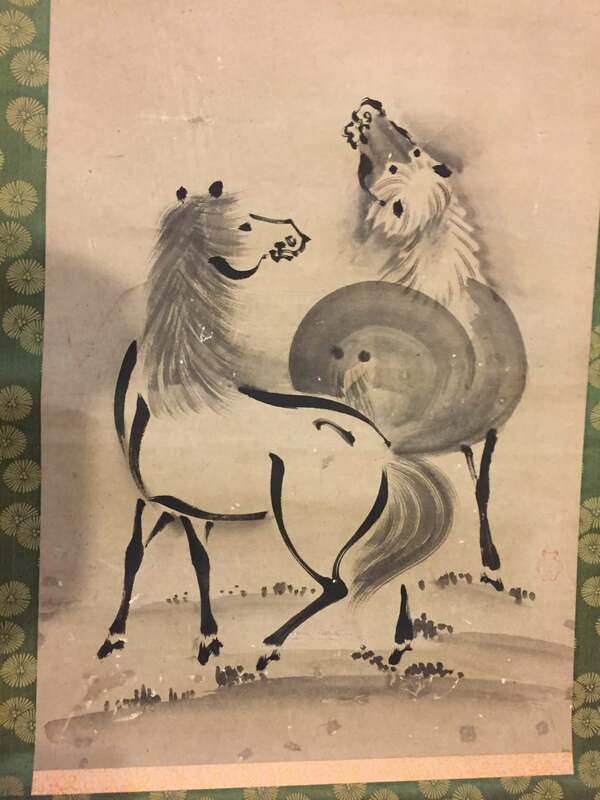 And also Radiant Stones Archaic Chinese Jades, the Myrna and Samurai Myers collection, 2000 curated by Filippo Salviati, PhD, entry 14, Bi Disc. 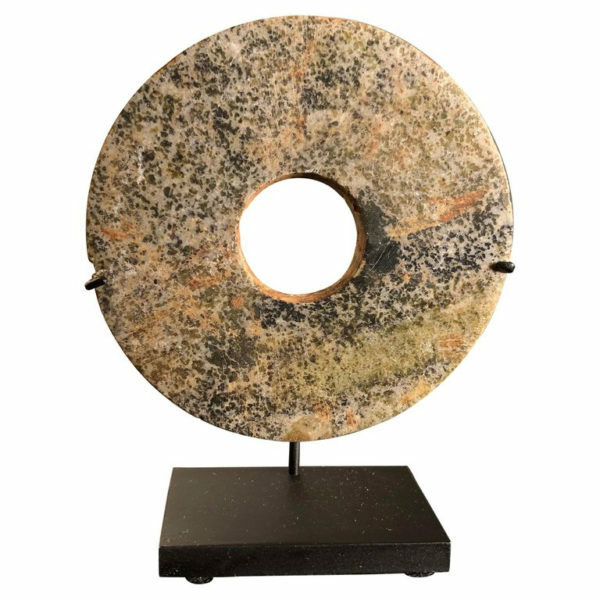 This is an elegant piece. 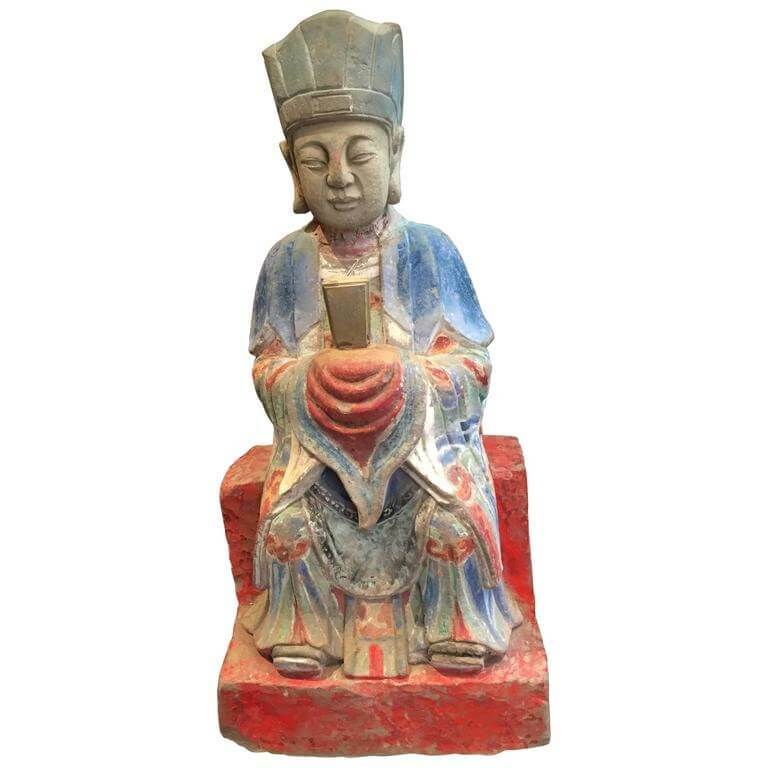 Important Chinese Daoist Sculpture of The Emperor of the North Pole, Hsuanwu or “Hsuan Tien Shangti”, Qing Dynasty (1644-1911), painted sandstone, 32″h. 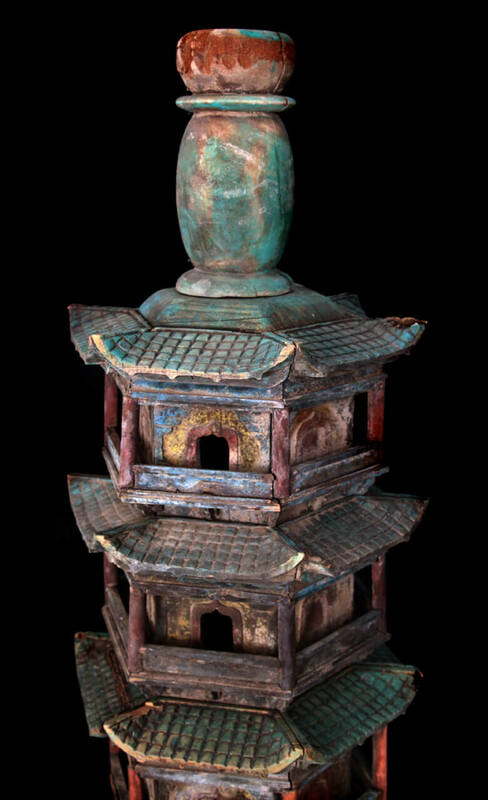 Formerly exhibited Asia Week New York City,Fuller Building, Hutton Gallery, 2006. 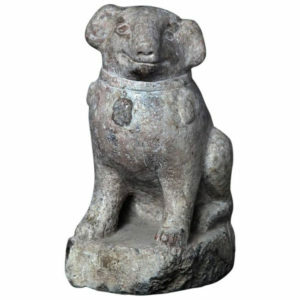 Provenance: Private Beijing collection and originally found in the vicinity of Chonqing. 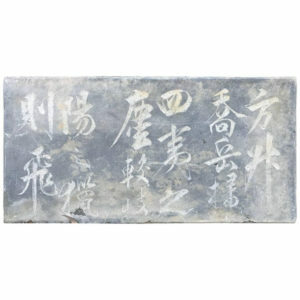 China, a large elegantly hand carved Calligraphy Stone Panel Qing Dynasty (1644-1911 C.E. 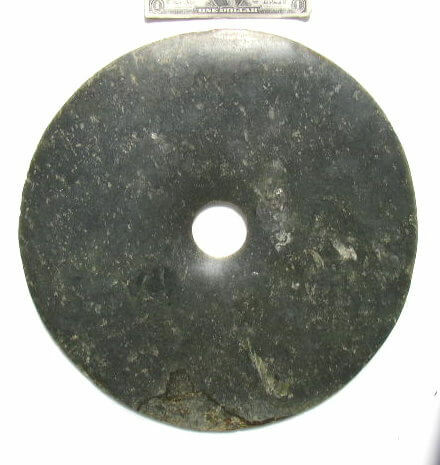 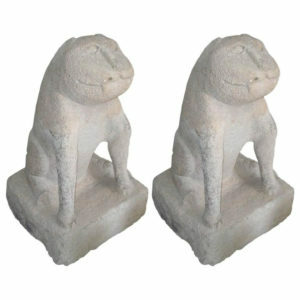 ), limestone, “30L. 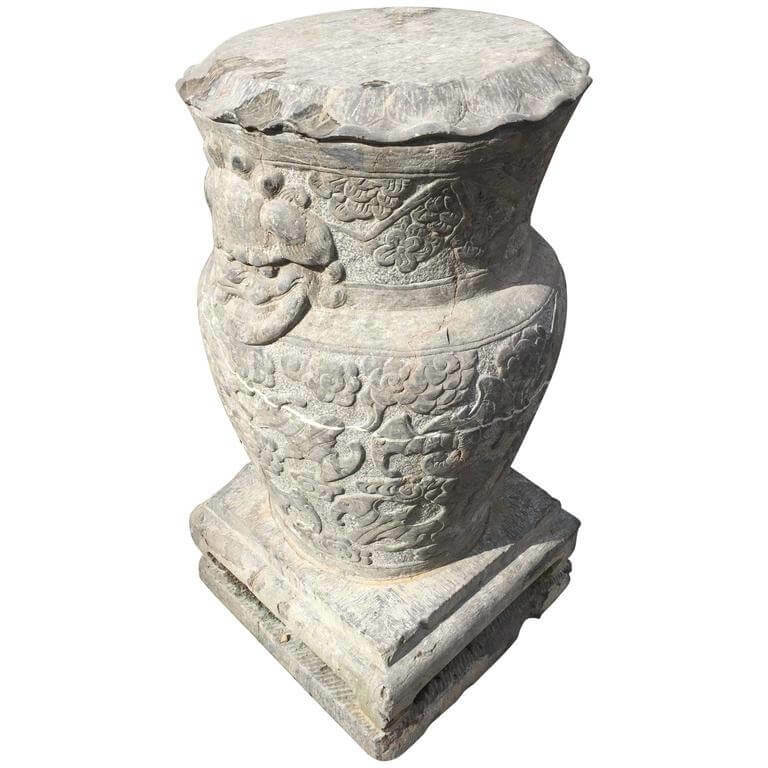 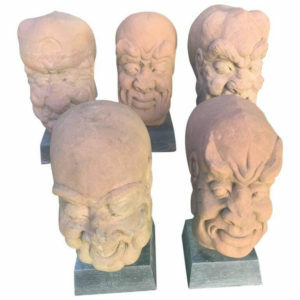 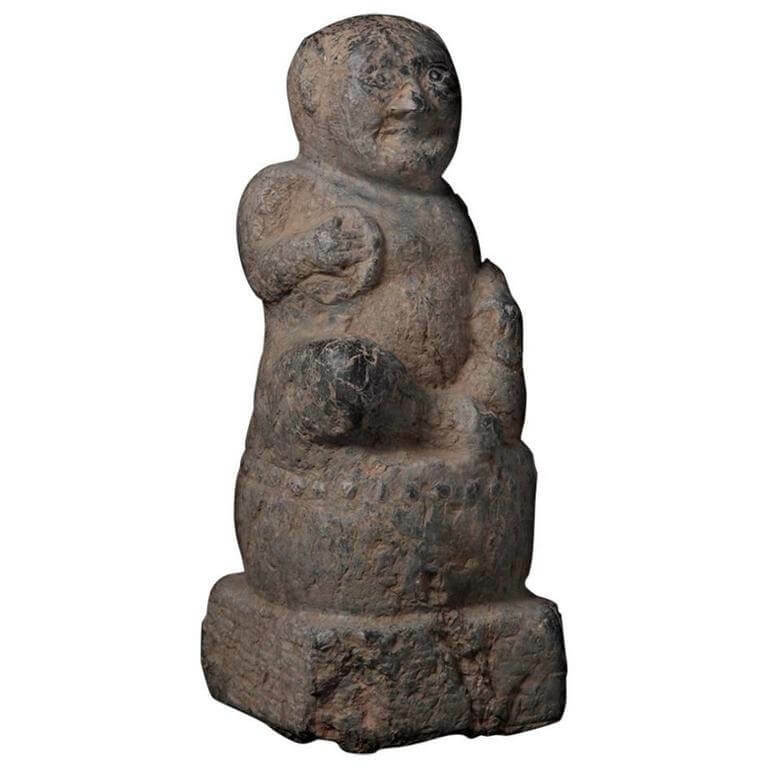 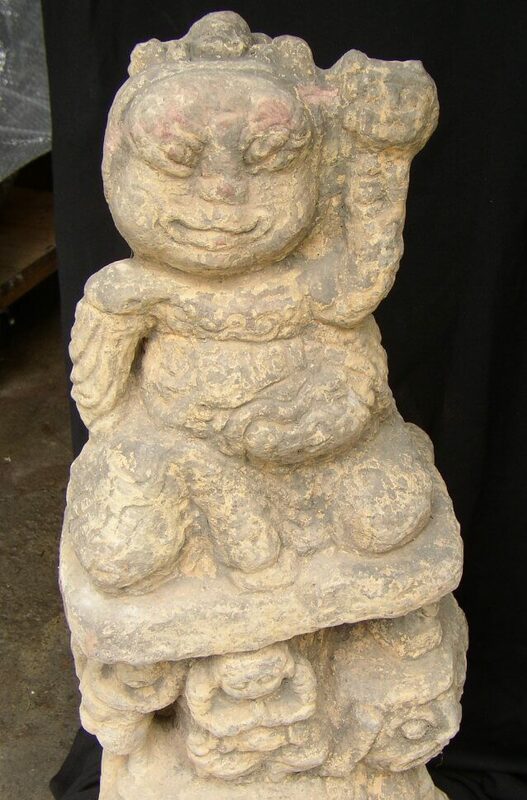 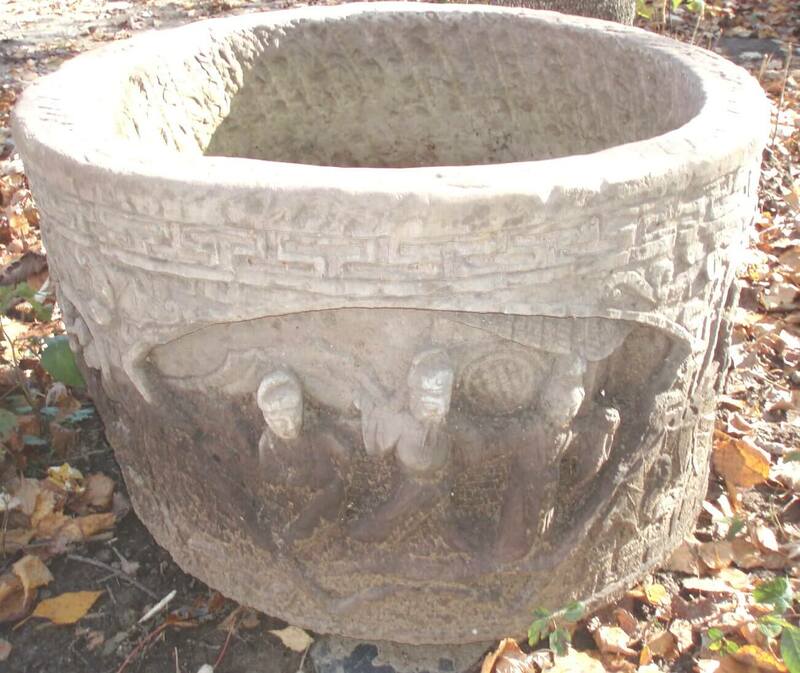 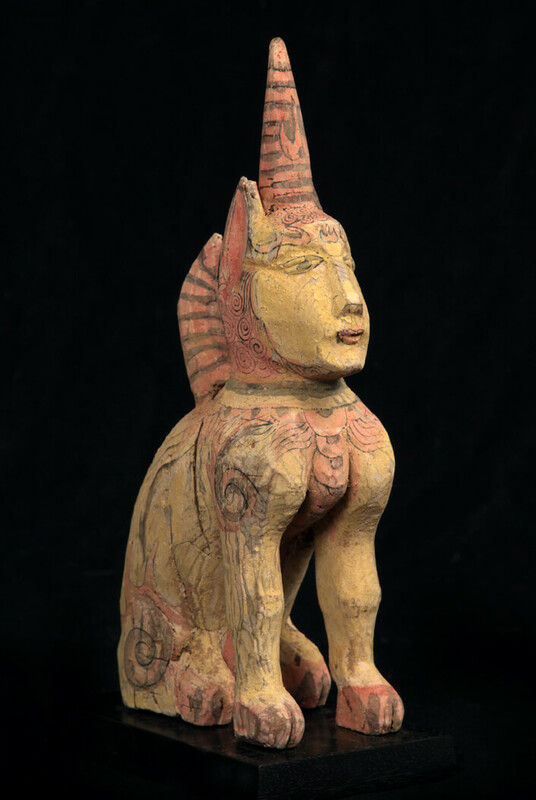 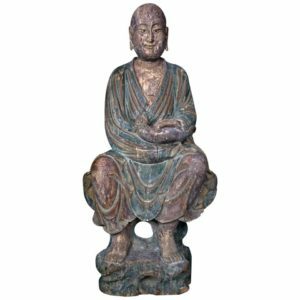 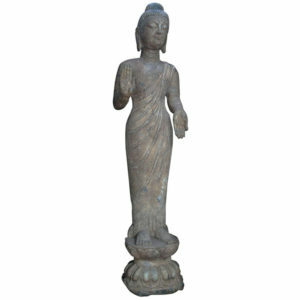 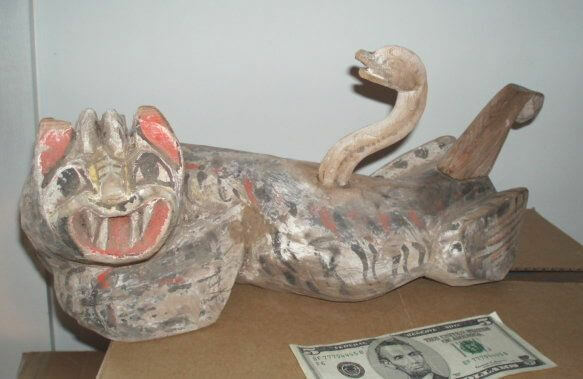 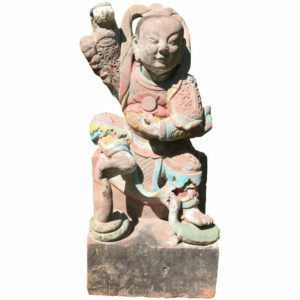 x 12″ w x 3.5” thick, Available: an attribution and authentication report from Dr. Qing Chang, Buddhist Sculpture Specialist.